Few saltwater fish taste better than cobia. Caught along the Gulf and Atlantic coasts, cobia is a prized catch for its fight and tasty white meat. Try this cobia wonton recipe for some fantastic finger food. Combine the fresh cobia, chopped green onions and seasoning in a food processor and pulse until it’s the consistency of hamburger. Set out the wonton wrappers, and place about half a teaspoon of the fish mixture on each one. Fold the wrappers as it’s described in the instructions on the outside of the package. Basically, you want to make it resemble a ravioli. Steam the cobia wontons in batches for three minutes (a wire rack over boiling water with a lid works if you don’t have a steamer). After steaming, you can freeze or refrigerate the wontons if you don’t plan on using them right away. When ready to serve, panfry the cobia wontons in batches in a little canola oil or melted butter until the wonton is just lightly browned and crispy. Serve with sweet chili dipping sauce for a yummy appetizer. You better make heaps because they won’t last long. For an even nicer presentation, serve the wontons with slices of fresh mango, drizzled with the sweet chili sauce. For more of Maggie’s recipes, visit Corkydecker.com and click on recipes. 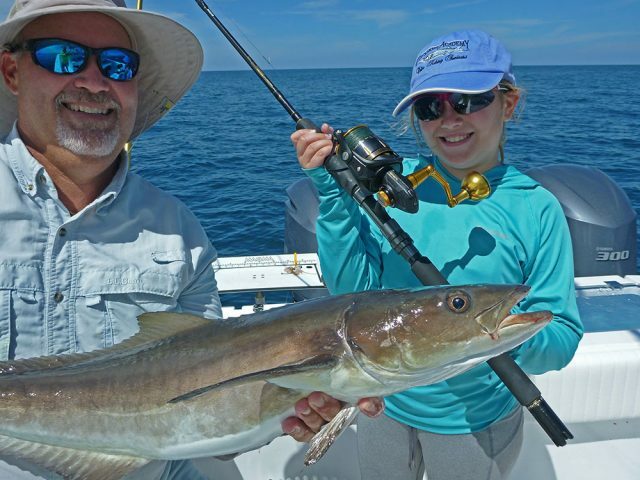 Learn how to fillet cobia HERE.